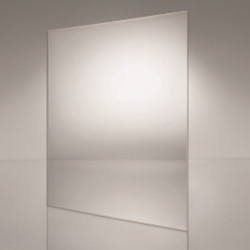 Crystal clear, impact- and weather-resistant, OPTIX® is a continuously processed, high quality acrylic sheet. High molecular weight makes OPTIX® ideal for almost any type of fabrication or glazing, while special UV stabilization protects the sheet from yellowing. Backed by a 10-year limited warranty, OPTIX® is available in a wide range of thicknesses and sizes.